Hello! You are not logged in or have not purchased this workshop. Please go back to the menu and purchase this workshop. Thanks for stopping by this workshop! You are either not enrolled in this workshop or not logged in. To login to a enrolled workshop, do so via the menu or click here. Would you like to enroll today? Click the button below to make your payment and get immediate access. We accept PayPal and Credit Cards. Once you’re enrolled in the workshop you can come right back to the workshops and click on this workshop and see that you have access as long as you are logged in. To login, you can do so via the menu. 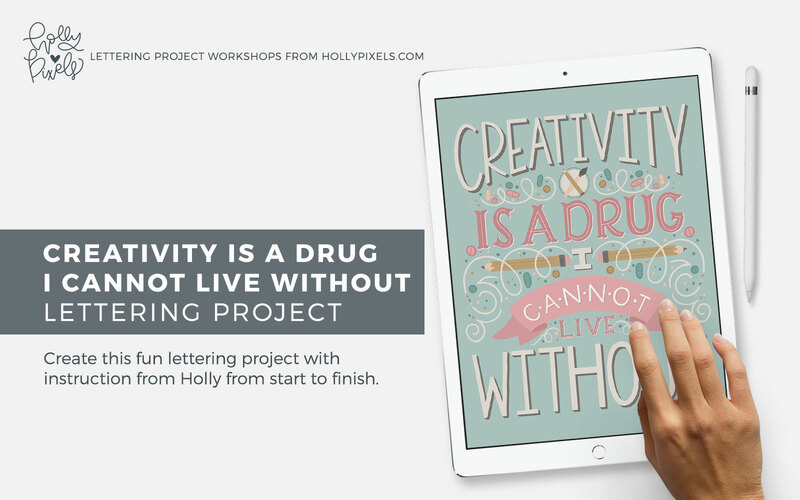 Holly will be using the iPad Pro, Apple Pencil and Procreate app to start her project and then move on to Adobe Illustrator to vector. You can use any medium to do these lettering projects. Paper and Pencil with markers, Adobe Photoshop, other apps. It doesn’t matter what medium you choose. Having Trouble Playing Videos on iPad/Mobile? There are some known issues with iOS and streaming in Quicktime format which is what browsers like Safari, Chrome, etc. use. After researching this on the Apple forums, people have had luck by downloading the Aloha browser from the Apple store. It apparently doesn’t use the Quicktime format for streaming videos.